» Blog Archive » Who’s the “Double” Daddy?! Above: Jockey Timmy Murphy below bringing Who’sthedaddy into the winners enclosure at Lingfield led by Kimberley Van der Vegt. Kimberley rides Who’sthedaddy out daily and has ridden as an apprentice. 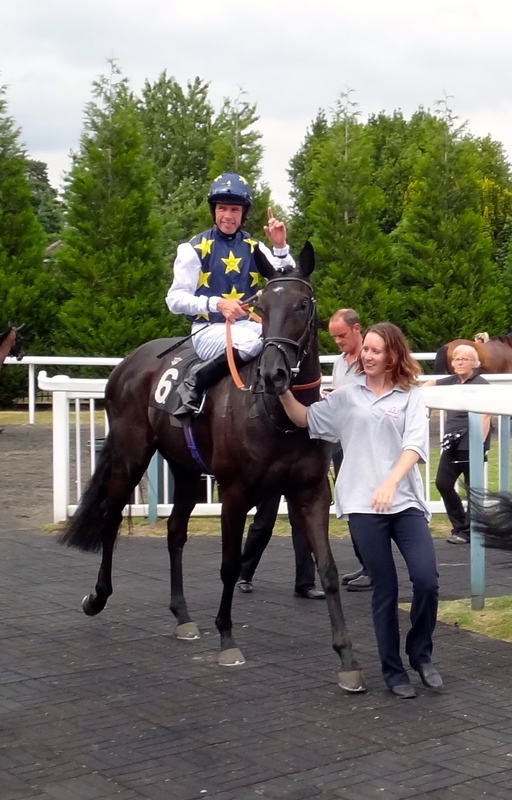 Following on from the win at Salisbury on July 11th Who’sthedaddy took to the track over a mile and a quarter at Lingfield on Wednesday 15th. Ridden again by jockey Timmy Murphy, he ran a great race to record a double within 5 days!! Plans are now in place to go for the “treble” on Friday 24th at Chepstow at 8.55, upping the trip to a mile and a half. The Lisa wilson scholarship Fund Annual Charity Golf Day takes place the following day – so no pressure! !